Selecting classes for each new semester in college motivated me. The list of classes needed for graduation were opportunities to learn something new. I didn’t view them as classes I had to take; I saw them as classes I got to take. Every term, filled with possibilities and new beginnings, held out the hope of something rewarding—at first. At the beginning of each term, I never considered the course requirements drudgery. But somewhere over the course of a semester, every class eventually grew into a burden. In some, the difficult coursework overwhelmed me. In others, the timing of exams was inconvenient. And still others were taught by professors I simply could not understand. Though each class reached a point where I would have gladly quit, I found that quitting was not an option if I wanted to graduate. But then the year drags on. The workload gets heavier. Sometimes disappointments set in, feelings get hurt, and people fail to respond the way we expected them to respond. 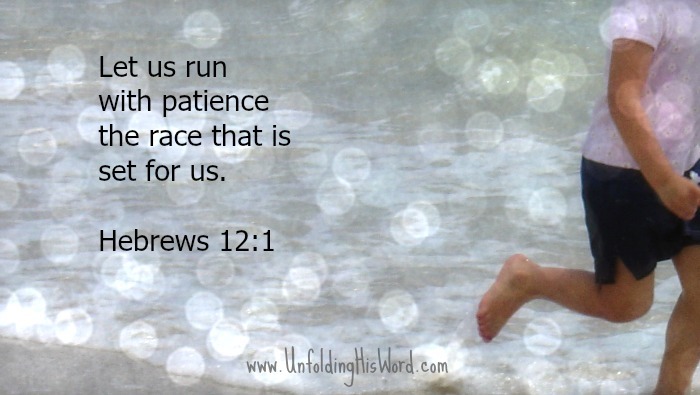 That’s when we need Hebrews 12:1…And let us run with patience the race that is set before us. Running with patience is not the same as waiting patiently. Waiting implies standing still. Running implies moving forward. We need a Christlike strength to persevere in spite of disappointment, frustration, or obstacles. Patience is translated as perseverance or endurance by more recent Bible translations, but the meaning is the same. We are to run and continue running. We are to complete the task—the race—that is set before us. The task set before me as a college student many, many years ago was exhausting at times. The semesters came and went, and somehow I survived. In spite of the difficulties that seemed to creep in at exam time, I still looked forward to choosing my classes for the next term. I recognized what a great privilege it was to be in college. New books to read, new classes to explore, new people to meet. The possibilities were always bright with opportunity. Today the possibilities are still bright. Despite the inevitable difficulties ahead, let’s run our race with Christlike patience. So true, Nivine. So many opportunities to get fed up or burned out. I like the phrase “Christlike strength.” That’s the key. So many times I’ve felt His breath on my flickering flame. Keep spurring us on. Thanks Sondra. I like that phrase too…encouraging.